So, I have a first world crafter problem! When I am trying to decide on what ink color to use for my projects, I go by the lid color. But lately, I have been finding out that this is not a good idea. The color on the lid is often very far off from what the actual color looks like when it is stamped. It frustrates me because I often pick the closest color to my scrapbook paper or other accents and want it to look as close to matching as possible. To remedy this problem, I decided to create ink swatches. I took regular 8 1/2″ x 11″ white scrapbook paper and cut it into 2″ x 3 1/2″ pieces. This allows enough room for a stamped image on the front and for me to write what ink pad it is on the back. I punched a hole in the top left corner of each piece so that I could put them on a ring. I used the My Favorite Things Abstract Art stamp set to stamp my images with each color. I then let the ink dry and then wrote the manufacturer’s name and the ink color name on the back. All of the pieces are organized by color so that I can find things easily. I stamped out my dye and hybrid inks, but not my distress inks. I will do that over the coming weeks. I may also add in some pieces that are a little larger so I can easily pick out where the blues, pinks, reds, etc are on the ring. I do have some tab dies that I haven’t used yet……… : ) If I do update it, I will show a picture here! Thanks for stopping by! Feel free to leave comments or questions and subscribe. Posted in ideas and tagged abstract art stamp set, creating ink swatches, dye inks, hybrid inks, ink colors not matching their lid colors, ink swatches, My favorite things, stamps. Bookmark the permalink. So, I will be the first to admit that I don’t know much about iMovie. I know I upload my video into it, do some basic editing (and by that I mean add a title, an info page and maybe some music) and then export it. I have read a little about editing and have watched a couple of YouTube videos awhile ago about it. But I haven’t really tired adding a voice over or creating fast forwarding frames. I have added some music, but that was usually just for the intro and the ending slides. Today’s video was LONG. And by long I mean almost 40 minutes. Who wants to sit and watch me watercolor for over half of that? Not even me!! So, my only choice was to edit and do some voice over work. I attempted it, but am not sure how I did. I tried to play the video back, but then I realized that it is already after 11 on Monday (and yes this is a Sketch Sunday video and NO not for next Sunday. As in yesterday Sunday. Whoops!) So I better start exporting! I’m not an expert in watercoloring by any means, but I do enjoy it. I use distress inks to color in my images and it’s fun. Again, I’m not the best so this isn’t a watercoloring technique video. I am so-so with shading – I just like to color! Thanks for stopping by! Feel free to leave comments or questions and subscribe! Posted in sketch sunday and tagged argyle, canson watercolor paper, creating a card from a sketch, distress inks, My favorite things, non stick craft mat, purple, sketch challenge, sketch sunday, using a sketch to create a card, using distress inks to water color, watercolor. Bookmark the permalink. I’m a day late (and a dollar short, right? ), but I wanted to let you all know about a great cause that I am hoping my readers will support. Hayden’s Heart is an organization I stumbled upon by accident. On Facebook one day, one of my friends had commented on something and I noticed that a co-worker of mine had commented on the same post. They don’t know each other and live hours apart. So, I decided to investigate and see how they knew each other! Turns out they didn’t. They both commented on a post by Hayden’s Heart. Hayden was a little boy who was born with CHD (check out Hayden’s Heart’s FB page or the foundation’s website for more info – https://www.facebook.com/haydensheartfoundation or http://Www.haydensheart.org/) that unfortunately passed away. In his mom, Addy’s grief, she found the strength to start an organization honoring Hayden. She has done an amazing job and worked tirelessly to promote his foundation and his memory. My friend, that I’ve known since high school, has a daughter that needed a heart surgery. While she was in there, she met a little boy who actually became one of Hayden’s Heart warriors. My co-worker knew of Hayden’s mom through a mutual friend and because friends with her after Hayden’s passing. When a message went out on Facebook asking for help from anyone who has a personal blog, I said that I would. I was asked to blog about this great opportunity for the Hayden’s Heart organization. Here’s the deal: They were chosen to partner with a company called Sevenly (Facebook page – https://www.facebook.com/sevenly.org and website – http://www.sevenly.org/?gclid=Cj0KEQiA9eamBRDqvIz_qPbVteABEiQAnIBTEKGLRKA2w_0w7U7orRW8RUpmb134gyrcsL1JK8OCC5kaAmUs8P8HAQ). They design apparel for the cause that they choose, which this week is Hayden’s Heart, and will donate from each sale to the charity. Please go over and support Hayden’s Heart! I don’t often ask for help with things like this, but it’s a cause that is special to me. Thank you. Hayden’s Heart will be the charity from February 9-15. Posted in Uncategorized and tagged charitable opportunity, charity, CHD, Hayden's Heart, helping out a good cause, non profit, Organization, sevenly, supporting charity. Bookmark the permalink. So this week’s Sketch Sunday has a “wild” theme! I bought the stamp and die set from My Favorite Things because of the lion in it awhile ago, but never used it. I originally bought it because in one of the pictures of one of my nieces in the NICU she looked like she was roaring so my sister called her a lion. I thought the lion stamp would be cute when I do her scrapbook. I know, I know – I bought a whole stamp set AND the matching dies for one stamp and die?? To prove I wasn’t crazy, I decided to use them in tonight’s Sketch Sunday. The inspiration for the card came from the Card Challenge Sketch over at My Favorite Things. (Sketch 214) http://www.cardchallenges.com/search/label/sketchchallenge. I wanted to also use the background stamp that I bought but never used either. 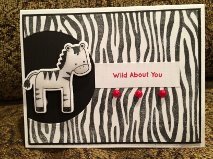 So, I took the zebra stamp from Wild Things, the zebra die from Wild Things and the Zebra Background stamp out of my stamp holders and started to formulate a design from the sketch. I first cut the card base down to 4 1/4″ x 5 1/2″ from white card stock and then a black piece of card stock to 4″ x 5 1/4″. I also cut a smaller piece of white card stock an 1/8″ of an inch smaller than the black card stock layer. I inked up the background stamp with some My Favorite Things Black Licorice Hybrid ink and stamped it on the smallest white card stock layer. Next, I took one of my Spellbinders circle dies and put about 3/4 of the circle on the stamped card stock and ran it though my Cuttlebug to create a cut out on the right side. This would allow the black card stock to show through. I adhered the stamped piece to the black layer and then those layers to the card base. Using the Hero Arts Shadow Ink in Red Royal, I stamped the sentiment “Wild About You” onto a small scrap of white card stock, which measures 3/4″ x 2 3/4″. I glued the sentiment piece down to the card base and then went to work on the focal image. Since I had already die cut the wafer thin zebra die from white card stock, I used the MFT black licorice ink to ink up the zebra stamp and stamp the image onto the cut out. I then used pop dots on the back of the image and attached it to the card base so that it was raised above the rest of the card layers. Finally, I placed a thin layer of glossy accents on top of the zebra for some added interest. The final step of the card was to add some bling underneath the sentiment. I used Bling It red pearls. They are on a row all together, so I cut off three and then separated them so I could space them out better than I did on the original in the video. Posted in Challenge, ideas, sketch sunday and tagged Bling it red pearls, card challenge, card inspiration, cards, challenge, creating a card from a sketch, glossy accents, Hero Arts shadow ink, hybrid ink, My favorite things, My Favorite Things ink, red royal, shadow ink, using a sketch to create a card, Wild Things Die set, Wild Things stamp set, zebra, zebra background, zebra stamps, zebra wafer thin dies. Bookmark the permalink. Just about everyone is raving about some new technique. I’m probably pretty late to the inlay die technique, but I decided to make this video anyway! I have been doing the technique for awhile and I think I even did a video on it. But, since I really like it, I thought that I would do this video. One of the reasons that it’s such a good technique for you to use is that if you mail your cards, this will cut down on the bulk. Since it’s pretty much one layer (minus the very thin copy paper you lay the piece down onto), it doesn’t add weight and expense to your cards! Another great feature is that ability to do two or more colors with little to no fuss! The die that I used for this is one that I have had for awhile. It is from My Favorite Things and it was one that was free with a $60 purchase. I loved it, but I just never really had the right occasion to use it. The die is a globe with the words “You Mean The World To Me” underneath of it. I knew that I wanted to do two colors with this cutout, so I took a piece of white card stock and I used two shades of green distress ink to color the paper. Those were Shabby Shutters and Mowed Lawn. I then taped the die down and cut it out. When I took the pieces out of the card stock, I realized I made a big mistake. I was left with the ocean from the die that was attached to the piece, not the greenery. Originally my plan was NOT to do this technique – I was actually just going to color a piece of card stock with shades of blue distress ink and glue it behind the cut out. Well, since I made that mistake, that plan went out the window! I inked up another piece of white card stock with some tumbled glass and salty ocean distress inks and then ran the piece through my Cuttlebug with the die. When I was looking at the waste, I then realized that these “mistakes” could be used in the piece! Now you have an almost one layer piece for the front of a card or for a scrapbook project! I love the way these inlay die cuts turn out because they have multiple colors, which adds interest. Posted in technique and tagged blue and green, inlay die cutting, masculine project, My favorite things, wafer thin dies, World die, You Mean the World To Me. Bookmark the permalink. So, for this week’s Sketch Sunday, I used the MFT Sketch Challenge. I know – shocking! (You can find the sketch here: http://www.cardchallenges.com/search/label/sketchchallenge). But, I did something different. There’s no card this week. I decorated the front of a plain, kraft bag! I got the kraft bag from Michael’s. They come in packs of 13 I believe and you can use the coupons on them. I’m sure I used at least a 50% off one! This is the first bag I have decorated since Christmas. I wanted to make cute bags for my nieces’ Valentine’s gifts. I started off typing in “Valentine’s” in the search bar of Design Space. (For those of you who don’t know, Design Space or DS is the website you use with the Cricut Explore to design what you want to cut). I found some conversation heart images that I wanted to use at first, but then I couldn’t get the papers to match. So, I decided to scratch that idea and use another image. There is an adorable image of a teddy bear dressed as Cupid in the Cricut Lite cartridge Teddy Bear Parade. So I typed in “Teddy bear” and found the image. I sized the bear to 5.52″ tall by 5.24″ wide. I then changed the colors of all of the pieces so that only a couple of sheets of card stock would be needed. His wings were changed to white and everything else was red, black, brown or tan! In the sketch there was a banner, so I again type in “banner” in the search box and a bunch of images came up. I chose one and sized it to 5.06″ long and .89″ wide. I changed the layers to be white and red so that they would match the teddy bear. I also chose some patterned paper. The heart piece that was used as the largest layer was cut to 7 3/4″ x 9 3/4″ since the bag is approximately 8″ x 10″. The darker pink paper with white polka dots was cut to 5″ wide and 4″ tall. The lighter pink paper needed to be narrower but taller so I cut that one to 5″ tall and 4″ wide. The last two pieces that I needed were the scallop at the bottom and the circle element. In a previous card I made, I had stamped a couple of the Chalkboard hearts from a Simon Says Stamp stamp set in Red Royal from Hero Arts Shadow Ink. The extras were sitting on my desk and I thought this would be a good project to use one on! I also found some Martha Stewart border stickers that could be cut in half to make the perfect scalloped edge. Once I had all my elements, I took some Tea Dye distress ink and inked around the edges of the tan pieces of the bear. After that was done, I put all of the pieces of the bear together. I then took the patterned papers and glued them down in the proper place. The banner was adhered together with the Zig Two Way Glue pen and added to the two smaller pieces of patterned paper. Once that was on, I could place the teddy bear on the same papers and then the bag was finished! I think that it came together very nicely! Thanks for stopping by! Feel free to leave comments or questions and subscribe if you aren’t already a subscriber. 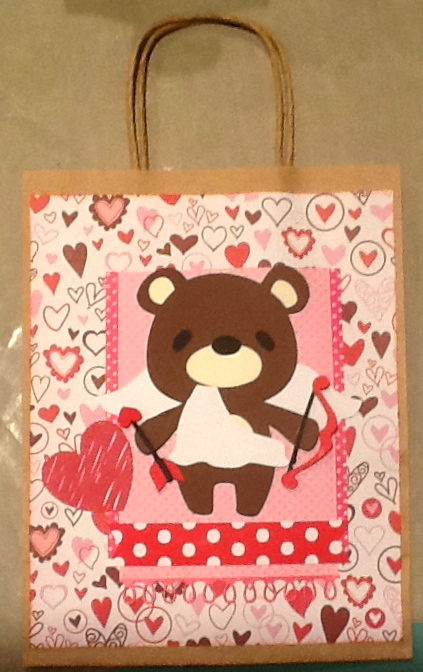 Posted in Challenge and tagged ATG, challenge, decorating a bag for Valentine's day, hearts, patterned paper, pink, polka dots, red, Simon Says Stamp, sketch challenge, teddy bear, Teddy Bear Parade Cricut cartridge, valentine's day projects, white. Bookmark the permalink.